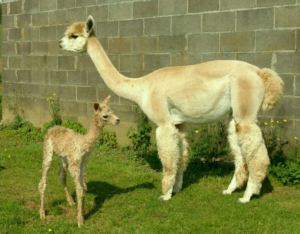 On May 27, our beautiful Elise gave birth to her first cria. 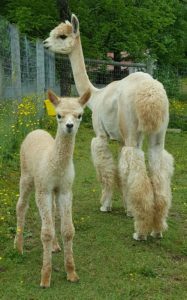 Hawkeye is a gorgeous, medium fawn little boy with dense curly fleece, and looks just like his sire Polar Ice. He weighed 21.9 pounds at birth and is full of energy, already wishing the other mamas would go ahead and give birth to his future playmates.